Army rebels are in control of Portugal tonight after an almost bloodless dawn coup ended nearly 50 years of dictatorship. Shortly after midnight, tanks rolled into the centre of Lisbon. The Salazar Bridge over the River Tagus was seized and the airport, radio and television centres were taken. 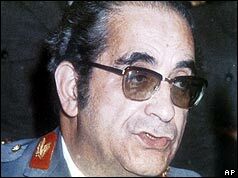 Troops armed with machineguns stormed the barracks where the Prime Minister, Dr Marcello Caetano, and several of his ministers had taken refuge. The former deputy armed forces minister, General Antoniio de Spinola, received the surrender of the prime minister, who has now fled into exile to the Portuguese island of Madeira. By sunrise the Movement of the Armed Forces, or MFA, was in control. It issued an immediate proclamation appealing for calm and patriotism. After almost five decades of dictatorship, it promised to restore civil liberties and hold general elections to a national assembly as soon as possible. The MFA condemned Portugal's foreign policy. After 13 years of fighting, it said, Portugal had been unable to achieve peace "between Portuguese of all races and creeds". It also called for a clean-up of state-run institutions which had legitimised the abuse of power. A seven-man junta, led by General Spinola, would oversee the transition period until democracy could be established. General Spinola and his troops received a hero's welcome from crowds, who gave them cigarettes, food, newspapers and carnations which were in full bloom at the time. In one violent outburst, up to six civilians were killed after shots were fired from the headquarters of the police station - and troops responded by storming the building. The Democratic Elections Commission group, which contested last year's parliamentary elections against the Government, issued a statement today saying that the group considered as positive "an act which could lead to the overthrow of a regime which for 50 years has oppressed the people of Portugal." The majority of Portuguese troops, nearly 140,000 out of 204,000, are posted overseas, propping up Portugal's tottering colonial empire in Angola, Guinea and Mozambique. General Spinola was sacked from his job as deputy armed forces minister last month after writing a book, Portugal and the Future, in which he argued that the Portuguese could not win its African wars by military means alone. He was Governor and Commander in Chief of Portuguese Guinea between 1968 and 1972 and was widely respected for trying to win over the hearts and minds of the local population. His book was regarded as heretical by the country's right-wing establishment - in particular his stated claim that Portugal was not defending the West and its civilization by colonising African states. The 25 April coup became known as the Carnation Revolution. It ended the longest dictatorship in Europe, the Estado Novo. The new regime pushed through a rapid and hasty programme of decolonisation. Over the next few years Guinea-Bissau, Mozambique, Cape Verde Islands, Sao Tome and Principe, and Angola all became independent. General Spinola served briefly as interim president and was succeeded by General Francisco da Costa Gomes. Between them they nationalised about 60% of the economy and carried out a major redistribution of land. Hundreds of political prisoners were released. Over the course of the next decade a stable two party system was established. Caetano spent the rest of his life in exile in Brazil. Freedom Day is now celebrated as a national holiday on 25 April.